Attention! Attention! There’s a new definition of Dental Sleep Medicine (DSM)–wait what? I know, I thought the same thing when I read this article. However, it did bring to mind some valuable information we can utilize from here on out for DSM. To begin with, dental sleep medicine is an extension of dentistry in which we an provide appropriate services for the treatment of sleep apnea. So, what is this new definition? Dental Sleep Medicine’s new definition goes above and beyond sleep apnea. This new definition takes the role of sleep apnea treatment and takes it one step further by incorporating pain into the equation. DSM is the discipline concerned with the study of the oral and maxillofacial causes and consequences of sleep-related problems. This helps to broaden the subject area to other problems in dentistry, such as orofacial or craniofacial pain, bruxism, and other areas. These disorders have been touched on as their own, but what about together? This “new” definition of dental sleep medicine can improve the services offered at your practice. To begin 2017 out on the right foot, I am excited to announce that on January 20-21 my first lecture will be “ABC – Airway, Bruxism & Craniofacial Pain”. This lecture will dive into this “new definition” of dental sleep medicine so you can continue to expand your dental practice services and expertise. Take the next step in providing proper care to your patients and by educating yourself in the New Year. With the availability of the ABC lecture and others, I can work with you to continue your education. In this study, mandibular repositioning devices (MRDs) are usually recommended as the first form of therapy for patients suffering from mild to moderate obstructive sleep apnea (OSA). Unfortunately, though, data on the long-term efficacy of MRDs hasn’t been readily available. 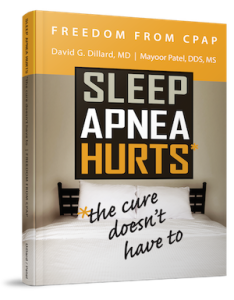 This is not only true for patients with OSA who are noncompliant with CPAP, but also in those with more severe OSA. To get a better understanding of the success of oral appliances, such as MRDs and the Narval appliance, the ORCADES study aimed to determine the long-term efficiency and tolerability of two custom-made Narval MRDs for the treatment of OSA patients. The study was completed over a three to six month period of time. Of a total of 369 patients involved in the study, overall MRD treatment was successful in approximately 76%. Additionally, complete response to treatment with MRDs was achieved in 64% of participants. The study also treated severe OSA with MRDs, and about 60% of the participants were effectively treated with about 38% having completed symptoms resolution. As a result, the use of MRDs in the treatment of sleep apnea significantly decreased a person’s sleepiness, and eliminated symptoms while improving their quality of life. Treatment with MRDs were very well tolerated and compliance was at its highest rate. Custom-made appliances, such as Narval MRDs, are effective forms of treatment for mild to severe OSA, as well as for patients who are CPAP noncompliant. Keep this study in mind when informing your patients of proper treatment options, as well as sharing with referring doctors. Vecchierini, M. F., Attali, V., Collet, J. M., d’Ortho, M. P., El Chater, P., Kerbrat, J. B., … & Mullens, E. (2016). A custom-made mandibular repositioning device for obstructive sleep apnoea–hypopnoea syndrome: the ORCADES study. Sleep Medicine, 19, 131-140. As you already know, temporomandibular joint disorders (TMD) refer to a cluster of conditions that are often characterized by pain in the temporomandibular joint (TMJ) or its surrounding tissues. The surrounding tissues might include the neck, head and even shoulders. Conditions involving the TMJ are so common among the adult population that up to 75 percent show at least one sign of TMD upon examination. Let’s take a look at some of the instances in which TMD can cause further complications and how to educate your patients. It has been shown that about 55 percent of patients with chronic headaches who were referred to a neurologist actually have signs of TMD. Without the education on TMD, signs and symptoms often go overlooked and no treatment can be found. As a dentist, you can put an end to the misdiagnosis of TMD by completing further education. You can also educate your patients on self-care techniques and referral for non-invasive treatment should be considered . Signs and symptoms of TMD improve over time with at-home care, and with oral appliance therapy from the dental office. Previous studies have even show that as many as 50% of patients improve in one year and 85% improve completely in three years. Encourage conservative treatment before any invasive options are considered. It is important to treat your patients properly without causing further complications. Contact my office to learn more about TMD and available treatment options, as well as upcoming lectures for continuing your education. 1. Lindsay, J. (2016). TMJ Disorder-The Painful (but Helpful) Truth. Pain. Approximately one in every four people who regularly visit their dentist has a condition called bruxism, which is an involuntary movement of the jaws when a person is sleeping. And, about 80% of those who do grind their teeth each night are unaware they are doing it. It can happen occasionally to some people without causing any severe damage, while others it can cause a lot of harm to their teeth. Unfortunately, though, those who experience regular teeth grinding face the possibility of dental problems and sleep disorders. One complication that can arise is temporomandibular joint disorder (TMD). TMD is a problem occurring within the jaw, jaw joint and the surrounding tissues. The TMJ is a hinge joint which attaches the lower jaw to the temporal bone of the skull found in front of the ear on the sides of the head, which allows for jaw movement and enables yawning, talking and chewing. When teeth grinding occurs at night, the TMJ can become damaged from the pressure causing a chain reaction to the surrounding tissues resulting in pain, injury and or joint degeneration. Approximately 75% of people with TMD have signs that suggest a sleep breathing disorder, such as sleep apnea. A narrow upper arch of teeth is 90% predictive of OSA and a retruded chin in 70% predictive of OSA. In other words, teeth grinding and TMD can affect more than just the jaw–it can be an underlying cause for sleep apnea and other sleep disorders. The tongue which is attached to the lower jaw acts as a pad when the jaw is not aligned under normal circumstances. When TMD is present, it is possible for the jaw to move and for it to become misaligned, which affects the bite and general size of the mouth. This change in size can result in the inability of the mouth to properly accommodate the tongue. When less space is available, the tendency is for the tongue to fall to the back of the mouth, which, in turn, creates a blockage in the air pathway. This obstruction then leads to episodes of pauses in breath or shallow breathing known as sleep apnea. To learn more about TMD and the connection with sleep apnea, feel free to contact my office or attend an upcoming lecture.